At the Denton, Texas, law office of Jones & Associates, clients can rely on accurate, professional services in a wide range of legal matters, including consumer law, consumer fraud, construction defects, family law, estate planning and probate, auto dealer fraud and business litigation. We accept clients in Denton, Lewisville and Flower Mound, as well as throughout Collin, Dallas, Tarrant, Wise and Cooke counties. Our team is known for our passion in not only providing exemplary legal services, but also in exceeding clients' expectations. This often means winning a difficult case that other attorneys were hesitant to touch, going above and beyond to ensure we competently defend our clients' rights. In addition, we know that many legal issues can be contentious, confusing or frightening for clients, particularly in the areas of family law, estate planning, consumer abuse and probate matters. At our law office, we are committed to answering questions promptly and honestly, as well as educating our clients throughout the legal process. We understand the importance of preserving family harmony and business relationships, and we prefer to resolve disputes through amicable means whenever possible. However, when litigation proves to be inevitable, we are prepared to vigorously represent our clients in the courtroom. We are committed to a high standard of honesty, compassion, outstanding customer service and impeccable legal ethics. 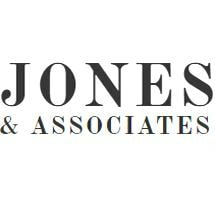 Potential clients of Jones & Associates are encouraged to discuss their legal concerns at our law office during a complimentary initial consultation. For the convenience of our clients, we also accept credit cards.